It’s an early start! Depart the UK on an early flight (we chose to fly Easyjet from Luton as the prices and flight times suited us) and arrive in Iceland in time for lunch. As you venture outside for the first time, the place feels grey and almost of another time. It’s cold, quiet and eerie but very intriguing. You can buy your return bus ticket into town in advance or at the airport although it’s not easy to find the bus once outside and so be prepared to ask. If you pay a little bit extra you get dropped right to your door (fully recommended given the small extra fee and because you may well be feeling too tired to navigate with a suitcase trailing behind you). We chose to stay at Center Hotel Thingholt which is very central, reasonably priced and very contemporary. The lobby is decorated with dark glass masks representing the hidden people of Iceland and a small waterfall trickling down over them. There is a small bar area just off reception which serves great value cocktails in the evening. Head to the Laundromat for lunch. Opened in March 2011, this little café is a stroll from the hotel and combines the practicalities of completing the week’s laundry and replenishment. You can pick up light bites or something more substantial if the early start has left you hungry (including good vegetarian and vegan options). Afterwards, take a walk to the nearby concert Hall, Harpa, to see what is on in the week. In the winter look out for free Christmas concerts which are short, mostly in Icelandic but immerse you in the Christmas (and Icelandic) spirit. Wonder back to your hotel via the water front and side streets, not forgetting to take in the Sun Voyager Sculpture and Höfði, and then (after a siesta) spruce up for an evening out. Cocktails in the bar, possibly a bite to eat and then relaxing listening to a live band. Try Kaldi for its local beers and homely feel, or if you fancy a night on the town (if you have any energy left!) try Club Solon and for live music go to Kaffi (Klapparstigur 25, Reykjavic, Iceland). A day exploring the capital. Start by visiting the Settlement Exhibition by the Tourist Information office. It doesn’t open until 10am and so if you’re up before that, head to Landakotskirkja beforehand (a little church nearby). This is a small museum but gives you a good understanding of how Iceland has developed over time. It’s a good place to start as it doesn’t get light in the winter until about 11am and so it won’t matter if you’re inside. Tourist Information is a great place to go to book all your trips for the week and so pay it a stop afterwards. Explore Hallgrimskirkja and don’t forget, if you want daytime shots, go between 11am and 3pm. Cafe Loki just opposite is well worth a stop. If you fancy trying the local delicacies, this is one of the places to go and even if not, it’s a good place to try Skyr. If you fancy something a bit more traditional, try the oldest coffee shop in town (Cafe Mokka) which serves up the best waffles and most warming hot chocolate on a cold winter day. If you’re out and about, don’t forget to stop at the Bernhoft Bakery not far from the hotel which sells wonderful cakes and pastries for that much needed sugar boost. Explore the art galleries (Hafnarhus was our favourite although if you love art, make sure you give yourself time to see all 3 included int he entrance fee) and don’t forget to take a walk around the small lake Tjörnin and if you’re brave enough and if it’s cold enough, get your selfie on the ice. Not far from here you can explore The National Museum of Iceland which makes your realise just how far this place has come is such a very short space of time; remarkable. Looking for somewhere to go for your evening meal? Try Café Paris which offers lots of choice and is very reasonable. Take a trip to the Blue Lagoon to relax after a hard day of sight seeing. You can catch a bus from the main bus station which is about a 20 minute walk from the hotel. You can buy your entry tickets from Tourist Information which means when you arrive you can walk straight in. Set away from the capital and close to the airport, many travellers will choose to do this trip on the way from or to the airport but others may want a more relaxing experience. If you go early in the day and before sunrise, you arrive to coloured lights illuminating the power station next door which provides the lagoon with its warm water. It’s a very unique experience running over sheets of ice in the darkness to plunge into warm waters and not be able to see more than a foot in front of you for all the steam. The lagoon has boxes silica mud situated around the edge for you to apply to your face and body which you leave on for 5 minutes and wash off in the spa water. Head back into town for an afternoon coffee and to sample another local favourite, dried cod or haddock. It doesn’t sound too appetising but try it with cocktails if you’d prefer and you may well go back for seconds. If you like lobster, you will love the very sweet cafe Saegreifinn which serves a lobster soup near the harbour. The seats are cushioned barrels and it’s very cozy but just what you want on a cold day. Try the local fish and chips at Icelandic Fish and Chips (it has recently moved from the harbour) which is almost self service but you can’t get it fresher. It’s a basic set up but the taste is everything but. Head on our for an evening boat trip to spot the northern lights (we chose Special Tours) and keep warm with free tea, coffee and hot chocolate and keep fueled with biscuits). You can go in land although that is a 4 hour trip as it involves a 1 hour bus journey either side. The boat trip races you out to sea in a matter of minutes although be warned, this is a cold trip and so wrap up warm. Also, if you’re there for photos, try the land trip as the boat can get quite rocky. Early start today! Head out on a pre-booked golden circle tour (we picked Iceland Guided Tours because it was a tour by mini bus and so much more efficient and also, it was the cheapest). 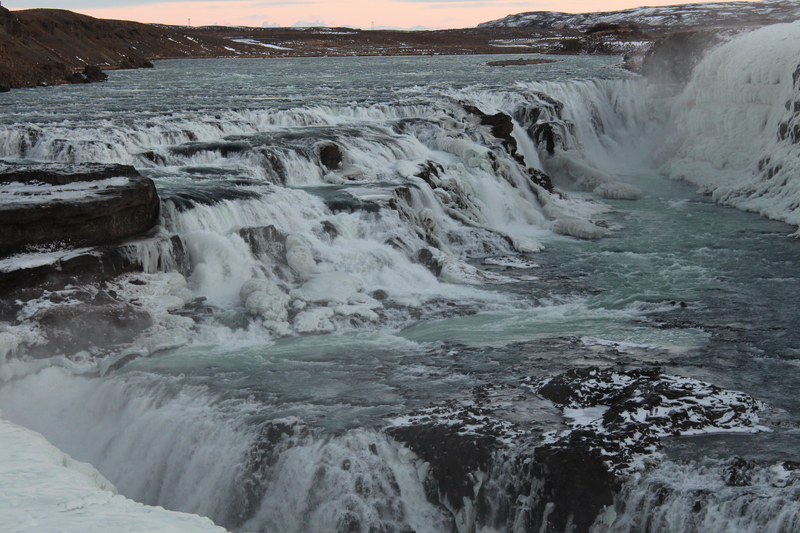 Get picked up from your hotel and take in Gullfoss, the geysirs and Thingvellir Park. If you are going in the Winter, you may find Yaktrax useful! Gullfoss is one of the coldest places we have ever been and taking your gloves off for just a minute can be very painful. If you’re there for photos, you will either need to be very brave or take a pair of well insulted and thin paid of gloves. After a long day exploring just some of Iceland’s most beautiful sights, you will deserve a very nice meal out. We tried Fiskfelagio Fish Company which offered a 3 course meal plus a gift from the chef, bursting with flavour. We did not expect Iceland to offer so much from a culinary perspective but we loved every meal there are were very impressed. Treat your tastebuds to anything on the menu and you will not be disappointed. Your final day. Spend this walking across glaciers, exploring more of the capital, taking a walk to Perlan (also a restaurant) just on the edge of the city for some wonderful views, go snowmobiling, horse riding or take a jeep tour (see Reykjavik Excursions which run a number of day tours). The choice really is endless. Take a quick bite at Hamborgarabulla Tomasar near the waters edge. You can’t miss this tiny round restaurant which radiates light from within in the lead up to Christmas and the burgers are good and brilliant value. It’s small and so be prepared to wait for a space. If you want to, take another tour out to see the northern lights as this may be your last chance. We were lucky enough to see them in the capital on our last night there which is unusual due to the light pollution and so another trip out to the darkness may well be your best bet. Another early start to catch your plane home (Icelandic chocolate and alcohol are very reasonably priced at the airport). A final bus ride through the middle of the night morning and you’re back at Keflavik Airport with a thousand memories and a desire to return.